Canal boats operating on the C&O Canal were registered by the Canal Company through the years. Upon the completion of the canal to Cumberland in 1851 the Board of Directors of the company issued a new set of regulations to govern the classification and equipment of the boats plying the waterway. These rules were largely a confirmation of the existing regulations, modified and brought up to date by the lessons of the first revisions. The new rules went into effect on April 1, 1851. Throughout the first year of operation on the completed waterway, a total of 223 boats were registered under the new regulations. During the years 1873–74, the C&O Canal Company surveyed the condition of the boats on the waterway and registered them on a new list. These were the peak years for the canal coal trade. Most of the boats were registered in 1873 and 1874, but this list also includes four boats registered in 1875 and 1876. The register lists 539 boats operating on the canal. Some boats are listed twice as they were sold in this time period and re-entered with a new name and owner. For example the boat named A. Cownton Gruber, owned by Steffey and Findley, became Arthur Gruber when E.P. Steffey bought out Mr. Findley. Class A—length (minimum of 89 feet; maximum of 92 feet); width (minimum of 14 feet; maximum of 14 feet, 6 inches); draft when empty (minimum of 11 inches; maximum of 18 inches); draft when loaded (minimum of 4 feet, 6 inches; maximum of 4 feet, 9 inches). Class B—length (minimum of 50 feet; maximum of 90 feet); width (minimum of 13 feet, 4 inches; maximum of 14 feet, 6 inches); draft when empty (minimum of 10 inches; maximum of 18 inches); draft when loaded (minimum of 2 feet, 6 inches; maximum of 4 feet, 9 inches). Class C—length (minimum of 88 feet; maximum of 96 feet); width (minimum of 14 feet; maximum of 14 feet, 6 inches); draft when empty (minimum of 10 inches; maximum of 18 inches); draft when loaded (minimum of 4 feet, 6 inches; maximum of 4 feet, 9 inches). Class D—length (minimum of 75 feet; maximum of 90 feet); width (minimum of 14 feet; maximum of 14 feet, 6 inches); draft when empty (minimum of 8 inches; maximum of 14 inches); draft when loaded (minimum of 3 feet; maximum of 4 feet, 6 inches). C&O Canal National Historical Park. The one class E boat belonged to Eyster and Son of Hall Town and was 90 feet in length, 14 feet, 2 inches in width, and had a draft of 1 foot when empty and 2 feet, 6 inches when loaded. Another registration of boats was conducted in 1878, one of the five surveys conducted by the canal company 1851 and 1889 (Unrau, p 360). This list includes Name of Boat, Captain, Owner of Boat, Builder, Year built, and By Whom Employed. So we learn that Kate Broderick was the Owner and the Captain of the H.J. Kenah, and that J. W. Johnson, an African American, was captain of the John Sammon. Harlan Unrau in his Chesapeake & Ohio Canal Historic Resource Study, 2007, noted that in 1851 the majority of boats were owned by individuals. 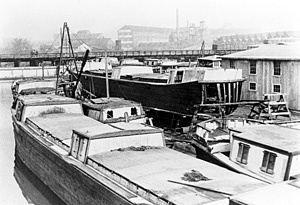 By the 1870s almost a quarter of the boats were owned by companies. The Canal Company boat registers were produced when the company wanted to get a better understanding of the boats on the canal. The 1880 census for Cumberland included three pages of canal boats that were moored there at the time the enumerator made his rounds. The information from this grouping is included as well on this page. Western Maryland Regional Library is most grateful to William Bauman, a volunteer with the Chesapeake and Ohio Canal Association, for transcribing the ledgers from the National Archives and making them available to the Western Maryland Room of the Washington County Free Library and the Western Maryland Regional Library. Thanks also to Karen Gray of the Chesapeake and Ohio National Historical Park.